Catching a skittish, displaced cat is usually a straightforward operation. After several days, an indoor-only cat that has escaped outside will typically be hungry enough to enter a humane trap baited with yummy cat food. But once in a while, a cat comes along who simply will not show interest in food. When this happens, volunteer “pet detectives” trained by Missing Animal Response Network (MARN) must become creative in their recovery methods. 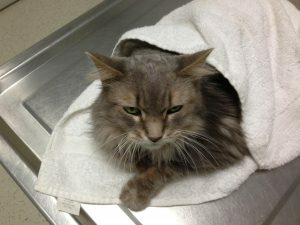 This is the story of one such creative recovery method and one very stubborn cat! 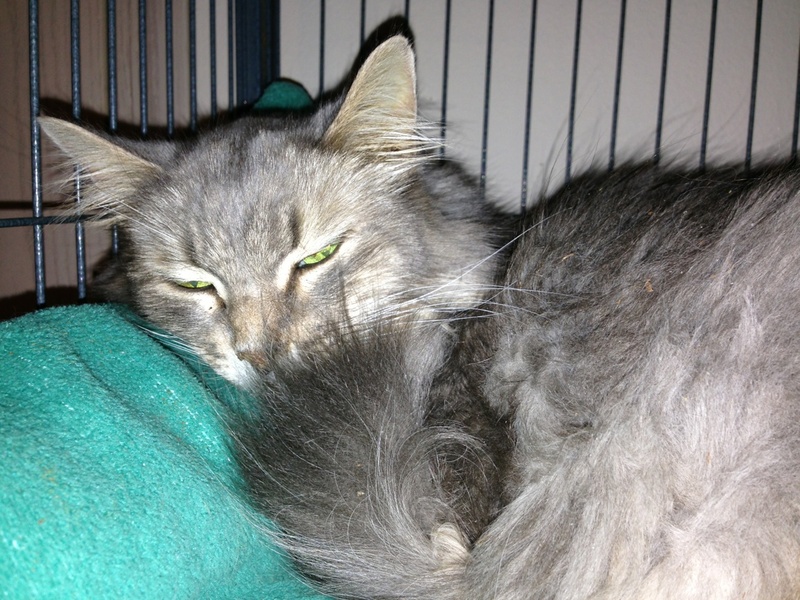 On August 23, 2013 MPP volunteer Chris Duvall learned that a cat named Gracie was displaced from her apartment in Federal Way, WA. Gracie’s owner, an elderly woman, had passed away inside of her apartment but her body was not discovered for two weeks. When emergency personnel responded, a door was apparently left open and Gracie bolted outside. 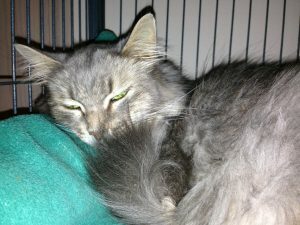 A week later, family members (who had no interest in adopting their Mom’s cat) had not seen Gracie and speculated that the skittish cat was now “gone.” When Chris learned that Gracie had a xenophobic (skittish) temperament, she knew (from her MAR training) that cats like Gracie don’t just “runaway” and that Gracie was likely still nearby. 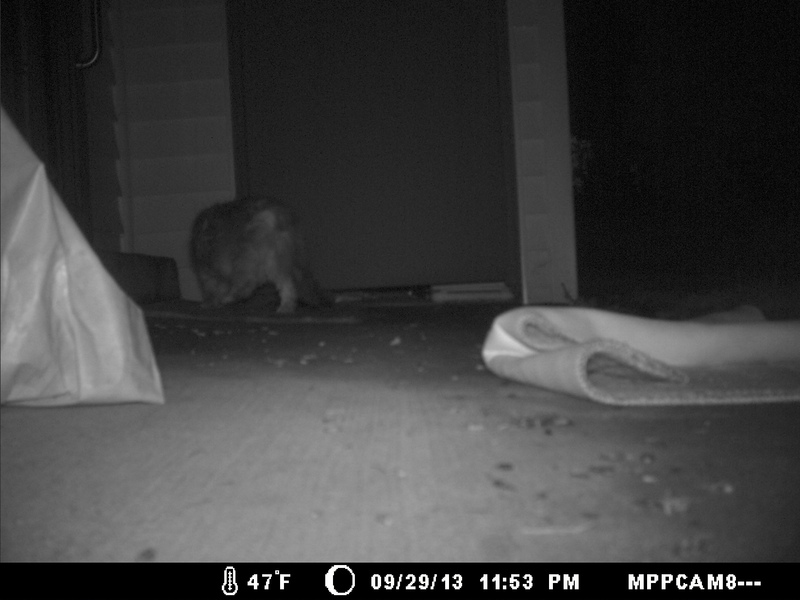 Chris responded and set up a baited humane trap and a digital wildlife camera on the back porch of Gracie’s apartment. On August 25th, Gracie was captured on camera on the back porch of her apartment, confirming that she was still in the immediate area. However, Gracie did not show any interest in the food left inside of the trap. It was presumed that she simply was not hungry enough yet and that it was only a matter of time before she was captured. 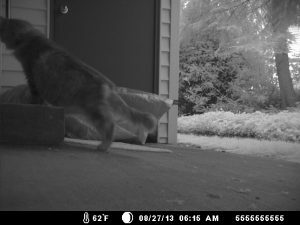 On August 27th 6:15 a.m., Gracie showed up on the back porch again (on camera). She still did not eat food. Instead, this time she stood at the back sliding glass door of her apartment (which was now under renovation) as if she wanted to go inside. Under normal circumstances, volunteers would’ve coached the owner in how to use the “House as Trap” method. House as Trap is a technique where cat (and sometimes skittish dog) owners use bait to lure a scared animal into a house (or garage) when a door is propped open and once the animal is detected (using a baby monitor or driveway alarm) upon entry, the door is closed, thus capturing the animal without having to use a humane trap. However, when we asked the management for permission for our volunteers to sit inside of the vacant apartment to conduct a stakeout, they denied permission. It became apparent that we needed to use another method to trap this wary cat. On August 31st when it became obvious that Gracie was just not going to enter a humane trap, Chris set up a drop trap and propped up under buckets, placing food under the trap to hopefully entice Gracie to start going underneath the trap for food. A drop trap is often used for cats that refuse to enter a standard metal humane trap. 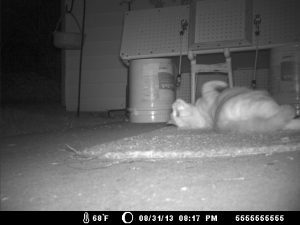 In addition to placing plenty of food under the drop trap, Chris spread cat nip on a rug that she placed in front of the trap. 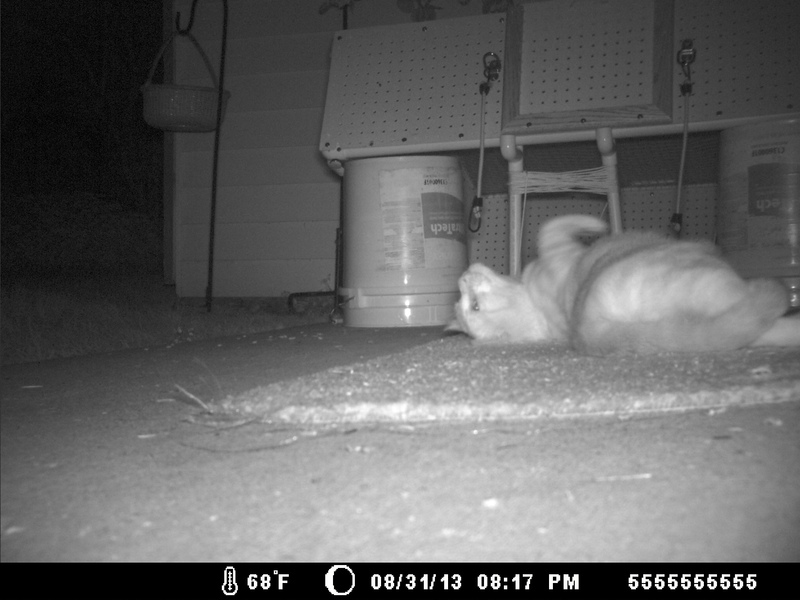 That first night, our camera showed that plenty of raccoons helped themselves to the pile of food and one very happy white cat enjoyed rolling around on the cat nip rug! Happy White Cat Rolls in Cat Nip! 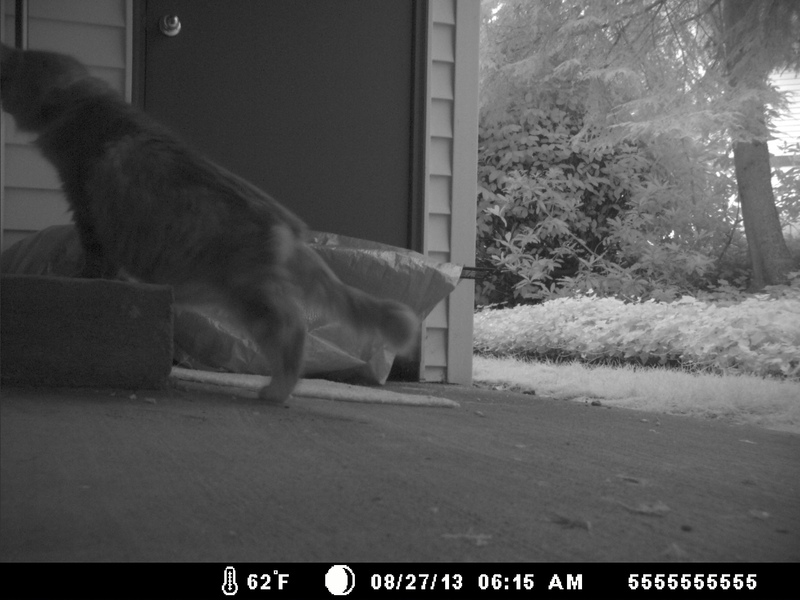 Although raccoons and the white cat ate well that week, Gracie did not show up on camera for three days. When she finally returned to the back porch, she did not go under the drop trap and she did not eat any food (that was left near the side of the drop trap). Gracie only went up to the back sliding glass door of the apartment, still wanting to go inside. Over the next several weeks, our efforts continued. Chris noticed a pattern of behavior in the hours that Gracie was showing up, usually around 6:00 a.m. To avoid feeding raccoons, Chris began responding to the apartment at 5:00 a.m. to put food out for Gracie. By September 14th, it was clear that Gracie was just not going to respond to food. Chris and her small group of volunteers (Jody, Debbie, Joannie, Shirley and Teresa) had tried every cat-bait under the sun—wet cat food, dry cat food, cat nip, Feliway (cat pheromone), fried chicken, you name it. The only thing that Gracie wanted was to enter that apartment, but because the apartment complex management would not give us access, we set up a new plan. If the new tenant who moved in (on October 1st) was cat friendly, we’d find a way to get their permission to let us into their apartment in the middle of the night and use the House as Trap method. And if that didn’t work (which knew it likely wouldn’t), we’d somehow convince one of the nearby cat loving neighbor’s to help us entice Gracie inside their apartment. We were truly grasping for straws! By September 17th, Chris came up with a new idea. 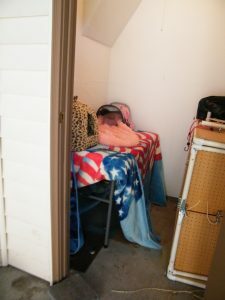 She used an unlocked storage closet on the back patio of Gracie’s apartment to set up a second humane trap. But instead of baiting this trap with food, Chris created a “comfort trap.” This was a humane trap placed inside the dark closet and tucked under a table (then covered with an American flag towel). Gracie’s bedding was placed at the base of the trap so that Gracie’s own sent would be inside the room and soft bedding was placed inside the set trap. Then the bedding was sprayed with Feliway. The door to this closet was left propped open. Chris hoped that Gracie would enter the trap not for food, but in search of a warm place to curl up. I personally didn’t hold out much hope for this method, but it was worth a try. Initially, Gracie showed zero interest in the closet. To her credit, Chris did not give up hope. Day after day, Chris or her volunteers showed up before dawn to put out food, to check the trap(s), to pull the SD card from the camera, and to record the results of what they’d captured on camera from the day before. Chris had learned to persevere in tough cat recovery cases, especially since she was the same volunteer who persistently worked to capture Bebe, a displaced cat that took 4 months to capture. On September 28th, Chris tried something new. She placed a Sentry “Good Behavior” lavender chamomile calming cat collar in the back of the comfort trap on the soft towels. Chris had seen remarkable results in using these collars on stressed cats and hoped that by placing it inside of the comfort trap, it might help to calm Gracie down and attract her into the trap. Because of stormy weather, Gracie didn’t show up on the 28th. However, the next day she showed up (at 11:53 p.m.), and went through the open closet door into the room with the comfort trap! This was the first time she entered the room with the comfort trap. Although she didn’t enter the trap, it was a step in the right direction! On September 30th, at 6:21 a.m., Gracie walked by the food baited humane trap on the patio, entered the closet door, and entered the comfort trap where she was finally captured! The Sentry collar, it seems, is what made the difference in this case. Having gone nearly 2 months with limited food, Gracie lost weight. Chris rushed her to the vet where they discovered that she was jaundiced, emaciated, dehydrated, was down to 7.1 pounds, and had no desire to eat. While the vet was concerned about her liver and kidneys, Gracie slowly recovered. After several weeks of care by Chris, Gracie is now ready to find a new “forever” home! The Gracie case is a prime example that while some lost cats can be recovered with a physical search of a neighbor’s yard or a properly placed neon lost cat poster, other cases are more complicated and require the time and dedication of trained resources. Lost cats not found are a major contributing factor to the extremely high euthanasia rates at animal shelters. Training resources (like Chris) in how to strategically recover displaced cats like Gracie is the mission of Missing Animal Response Network. On-line 8-week “pet detective” training courses offered by MARN are always available. If you’d like more info on how you can be trained by MARN to do what Chris did and help capture elusive cats (and skittish dogs) in your community, click here.